Jeanne Louise Calment (French: [ʒan lwiz kalmɑ̃]; 21 February 1875 – 4 August 1997) was a French supercentenarian from Arles, and the oldest human whose age was well-documented, with a lifespan of 122 years and 164 days. Her longevity attracted media attention and medical studies of her health and lifestyle. According to census records, Calment outlived both her daughter and grandson. She was widely reported to have been the oldest living person in 1988 at 112, and was declared the oldest person ever in 1995 at age 120. Calment's age has been challenged by a researcher claiming that her daughter Yvonne may have assumed Calment's identity in 1934. Other researchers have criticised this hypothesis on the basis of extensive prior research into Calment's life. Calment was born in Arles, Bouches-du-Rhône, Provence, on 21 February 1875. Her father, Nicolas Calment (8 November 1837 – 28 January 1931), was a shipbuilder, and her mother, Marguerite Gilles (20 February 1838 – 18 September 1924), was from a family of millers. She had an older brother, François (25 April 1865 – 1 December 1962). Some of her close family members also lived an above-average lifespan: her brother lived to the age of 97, her father to 93, and her mother to 86. On 8 April 1896, at the age of 21, she married her double second cousin, Fernand Nicolas Calment (1868–1942). Their paternal grandfathers were brothers, and their paternal grandmothers were sisters. He had reportedly started courting her when she was 15, but she was "too young to be interested in boys". :4–21 Fernand was heir to a drapery business located in a classic Provençal style building in the center of Arles, and the couple moved into a spacious apartment above the family store. Jeanne employed servants and never had to work; she led a leisurely lifestyle within the upper society of Arles, pursuing hobbies such as fencing, cycling, tennis, swimming, rollerskating ("I fell flat on my face"), playing the piano and making music with friends. :4–21 In the summer, the couple would stay at Uriage for mountaineering on the glacier. ("Even at 16 I had good legs.") They also went hunting for rabbits and wild boars in the hills of Provence, using an "18mm rifle" [sic]. Calment said she disliked shooting birds. :4–21 She gave birth to her only child, a daughter named Yvonne Marie Nicolle Calment, on 19 January 1898. Yvonne married army officer Joseph Billot on 3 February 1926, and their only son, Frédéric, was born on 23 December of the same year. Yvonne Calment died of pleurisy on 19 January 1934, after which Jeanne raised Frédéric, although he lived with his father in the neighbouring apartment. World War II had little effect on Jeanne's life. She said that German soldiers slept in her rooms but "did not take anything away", so that she bore no grudge against them. In 1942, her husband Fernand died, aged 73, reportedly of cherry poisoning. :4–21 By the 1954 census, she was still registered in the same apartment, together with her son-in-law, retired Colonel Billot, Yvonne's widower; the census documents list Jeanne as "mother" in 1954 and "widow" in 1962. Frédéric Billot lived next door with his wife Renée. Her brother François died in 1962, aged 97. Her son-in-law Joseph died in January 1963, and her grandson Frédéric died in an automobile accident in August. 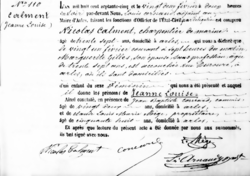 In 1965, aged 90 and with no heirs left, Calment signed a life estate contract on her apartment with notary public André-François Raffray, selling the property in exchange for a right of occupancy and a monthly revenue of 2,500 francs (€380) until her death. Raffray died in 1995, by which time Calment had received more than double the apartment's value from him, and his family had to continue making payments. Calment commented on the situation by saying, "in life, one sometimes makes bad deals." In 1985, she moved into a nursing home, having lived on her own until age 110. 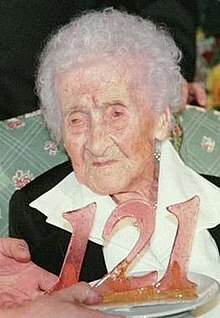 In 1986 Jeanne Calment became the oldest living person in France at the age of 111. Her profile increased during the centennial of Vincent van Gogh's move to Arles, which occurred from February of 1888 to April of 1889 when she was 13-14 years old. Calment claimed to reporters that she had met Van Gogh at that time, introduced to him by her (future) husband in her uncle's shop. She remembered the meeting as a disappointment, and described him as ugly and an alcoholic. She was recognised by the Guinness World Records as the world's oldest living person when she was 112. At the age of 114, she briefly appeared in the 1990 documentary film Vincent and Me, walking outside and answering questions. Her celebrity further increased when Guinness named her the oldest person ever in 1995. Far exceeding any other verified human lifespan, Calment was widely reckoned the best-documented supercentenarian ever recorded. For example, she was listed in fourteen census records, beginning in 1876 as a one-year-old infant. After Calment's death, at 122 years and 164 days, 116-year-old Marie-Louise Meilleur became the oldest validated living person. Several claims to have surpassed Calment's age were made, but no such case was proven. For over two decades, Calment has held the status of the oldest-ever human being whose age was validated by modern standards. In 1994, the city of Arles inquired about Calment's personal documents, in order to contribute to the city archives. However, reportedly on Calment's instructions, her documents and family photographs were selectively burned by a distant family member, Josette Bigonnet, a cousin of her grandson. The verification of her age began in 1995 when she turned 120, and was conducted over a full year. She was asked questions about documented details concerning relatives, and about people and places from her early life, for instance teachers or maids. A great deal of emphasis was put on a series of documents from population censuses, in which Calment was named from 1876 to 1975. The family's membership in the local Catholic bourgeoisie helped researchers find corroborating chains of documentary evidence. Calment's father had been a member of the city council, and her husband owned a large drapery and clothing business. The family lived in two apartments located in the same building as the store, one for Calment, her husband and his mother, one for their daughter Yvonne, her husband and their child. Several house servants were registered in the premises as well. Apocryphal media articles reported varying details, some of them unlikely. One report claimed that Calment recalled selling coloured pencils to Van Gogh, and seeing the Eiffel Tower being built. Another wrote that she started fencing in 1960, aged 85. Calment reportedly ascribed her longevity and relatively youthful appearance for her age to a diet rich in olive oil. She is also said to have credited her calmness, saying, "That's why they call me Calment." Demographers have highlighted that Calment's purported age is a statistical outlier, her lifespan being around four to five years longer than the next oldest people ever documented. Natalya Gavrilova and Leonid Gavrilov argued in 2000 that this anomaly casts doubt on the authenticity of her age, and that the evidence for her being genuine was inadequate to overcome this doubt. An official in the finance ministry was anonymously quoted commenting on the life estate, "Let's just say we saw the records and looked the other way." In 2018, Russian gerontologist Valery Novoselov and mathematician Nikolay Zak revived the theory that Calment died in 1934 and her daughter Yvonne, born in 1898, assumed her mother's official identity. A Russian scientific journal rejected Zak's paper as being too informal, as did the bioRxiv preprint repository, and Zak published it instead on ResearchGate, a social networking site for scientists and researchers. The theory attracted widespread media attention around 30 December 2018 after postings by gerontology blogger Yuri Deigin went viral. In January 2019, Zak's paper was accepted for publication in the journal Rejuvenation Research. Belgian demographer Michel Poulain said that although Zak's paper was detailed and made a good case, Jean-Marie Robine, one of two validators of Calment, said that she had correctly answered questions about things that her daughter could not have known. Robine also dismissed the idea that the residents of Arles could have been duped by the switch. Michel Allard, the second doctor who helped verify Calment's records, said that the team had considered the identity switch theory while Jeanne was still alive because she looked younger than her daughter in photographs, but similar discrepancies in the rates of aging are commonly found in families with centenarian members. Allard said the evidence brought forward by Novoselov and Zak was inconclusive. The Washington Post, after interviewing several experts, noted that "statistically improbable is not the same thing as statistically impossible." After a meeting of the National Institute for Demographic Studies (INED) in Paris on 23 January 2019, French, Swiss and Belgian longevity experts stated that the Russian study provided no proof of an identity substitution and considered that an exhumation may be needed to settle the controversy. After her brother, her son-in-law and her grandson died in 1962–63, Calment had no remaining family members. She lived on her own from age 88 until shortly before her 110th birthday, when she decided to move to a nursing home. Her move was precipitated by the winter of 1985 which froze the water pipes in her house (she never used heating in the winter) and caused frostbite to her hands. :4–21 According to one of her doctors, she had been quite healthy until she moved to the nursing home, and only began showing signs of aging during her stay. After her admission to the Maison du Lac nursing home in January 1985, aged 109, Calment initially followed a highly ritualised daily routine. She requested to be awoken at 6:45, and started the day with a long prayer at her window, thanking God for being alive and for the beautiful day which was starting, sometimes loudly asking the reason for her longevity and why she was the only one alive in her family. Seated on her armchair she did gymnastics wearing her stereo headset. Her exercises included flexing and extending the hands ("a distinguished woman must have beautiful hands"), then the legs. Nurses noted that she moved faster than other residents who were 30 years younger. Her breakfast consisted of coffee with milk and rusks. At the age of 118, she was submitted to repeated neurophysiological tests and a CT scan. The tests showed that her verbal memory and language fluency were comparable to those of persons with the same level of education in their eighties and nineties. Frontal brain lobe functions were relatively spared from deterioration, and there was no evidence of progressive neurological disease, depressive symptoms or other functional illness. Her cognitive functioning was observed to improve slightly over the six-month period. Calment reportedly remained "mentally sharp" until the end of her life. Bertrand Jeune, Robine and other researchers compared Jeanne Calment with nearly 20 people worldwide who had been verified to have reached at least 115 years of age. They concluded that the lives of these people differed widely and that they had just a few common traits: most of them were female (only two were male), most smoked little or not at all, and they had never been obese. They all had exhibited strong characters, but not all were domineering personalities. Although they aged slowly, all became very frail and their physical fitness declined markedly, especially after age 105. In their final years, they required wheelchairs and were nearly blind and deaf. "But they did not fear death, and they appeared to be reconciled to the fact their lives would soon end." Calment died of unspecified causes on 4 August 1997 around 10 am Central European Time. The New York Times quoted Robine as stating that she had been in good health, though almost blind and deaf, as recently as a month before her death. ^ In a 1988 Paris Match interview, this photograph was labeled "Jeanne Calment, then 22 years old, in 1897" (Jeanne Calment, alors âgée de 22 ans, en 1897). In a biography of Calment published in 1995, the photograph was correctly labeled "Jeanne Calment's daughter Yvonne" (Yvonne, la fille de Jeanne Calment), but undated. On the Gerontology Research Group's gallery of Calment's pictures, it was captioned "At age ~22" between 2007 and 2018, and was corrected after Russian researchers contacted the GRG. ^ a b c d e f g h Whitney, Craig R. (5 August 1997). "Jeanne Calment, World's Elder, Dies at 122". The New York Times. Retrieved 4 August 2008. ^ a b c d e f g h i j k Robine, Jean-Marie; Allard, Michel (1999). "Jeanne Calment: Validation of the Duration of Her Life". In Jeune, Bernard; Vaupel, James W. (eds.). Validation of Exceptional Longevity. Odense University Press. ISBN 87-7838-466-4. Retrieved 9 January 2018 – via Max Planck Institute for Demographic Research. ^ a b Addy, Ronda (25 May 2008). "Life Expectancy". Sun Journal. Archived from the original on 1 February 2009. Retrieved 6 August 2008. ^ a b Zak, Nikolay (30 January 2019). "Evidence that Jeanne Calment died in 1934, not 1997". Rejuvenation Research. doi:10.1089/rej.2018.2167. Retrieved 31 January 2019. ^ a b c d e f g h i j k l m Allard, Michel; Lèbre, Victor; Robine, Jean-Marie; Calment, Jeanne (1998). Jeanne Calment: From Van Gogh's Time to Ours, 122 Extraordinary Years. W.H. Freeman. ISBN 978-0-7167-3251-8. ^ a b c d e f g h i j k l Garoyan, Georges (1990). Cent-quatorze ans de vie ou la longue histoire de Jeanne Calment, doyenne d'âge de France [One hundred and fourteen years of life, or the long history of Jeanne Calment, France's oldest person] (in French). Marseille: Université d'Aix-Marseille II. ^ Loguinova-Yakovleva, Victoria (31 December 2018). "La longévité de Jeanne Calment mise en doute par des scientifiques russes" [Russian scientists cast doubts on Jeanne Calment's longevity]. France Soir (in French). Agence France Presse. ^ a b c Chevallier, Hélène; Jourdain, Stéphane; Emanuele, Valeria (2 January 2019). "Les experts qui ont validé la longévité de Jeanne Calment répondent aux chercheurs russes point par point" [Experts who validated Jeanne Calment's longevity refute each point by Russian researchers]. France Inter (in French). Retrieved 2 January 2019. ^ a b "World's oldest person dies at 122". CNN. Reuters. 4 August 1997. Retrieved 4 August 2008. ^ "A 120-Year Lease on Life Outlasts Apartment Heir". The New York Times. Associated Press. 28 December 1995. Retrieved 17 January 2018. ^ "Go, granny, go". The Anniston Star. 2 July 1986. p. 7. ^ a b c d "World's oldest person dead". McCook Daily Gazette. Associated Press. 4 August 1997. p. 1. Retrieved 5 May 2011. ^ Jeanne Calment, 114 ans, a rencontré Van Gogh [Jeanne Calment, 114, met Van Gogh]. Antenne 2 (in French). Institut national de l'audiovisuel. 21 January 1989. Retrieved 26 November 2011. ^ a b Dimery, Rob (18 August 2015). "1988: Oldest Living Human Being of All Time". Guinness World Records. Retrieved 9 January 2019. ^ Hopper, Tristin (31 December 2018). "History's oldest woman a fraud? Russian researchers claim 122-year-old Jeanne Calment was actually a 99-year-old imposter". National Post. Toronto, Canada. Retrieved 1 January 2019. ^ a b Zak, Nikolay (December 2018). "Jeanne Calment: the secret of longevity". ResearchGate. doi:10.13140/RG.2.2.29345.04964. Retrieved 27 December 2018. ^ "World's oldest person marks 120 beautiful, happy years". Deseret News. Associated Press. 21 February 1995. Retrieved 3 April 2010. ^ "Alcohol, Cigarettes, Chocolates, and Sweets – The Secrets of a Long Life?". Mail Online. ^ "Été 88. Jeanne Calment, la mamie du monde". Paris Match. 1 July 1988. Archived from the original on 21 October 2018. Retrieved 11 January 2019. ^ Simonoff, Gabriel (1995). Jeanne Calment : La passion de vivre [Jeanne Calment: a passion for life] (in French). Éditions du Rocher. p. Illustrations. ISBN 978-2-268-01938-3. Retrieved 27 December 2018. ^ "Photo Gallery of Madame Jeanne-Louise Calment [1875 - 1997]". Gerontology Research Group. Archived from the original on 12 March 2007. Retrieved 27 December 2018. ^ "Photo Gallery of Madame Jeanne-Louise Calment [1875 - 1997]". Gerontology Research Group. Archived from the original on 19 August 2018. Retrieved 27 December 2018. 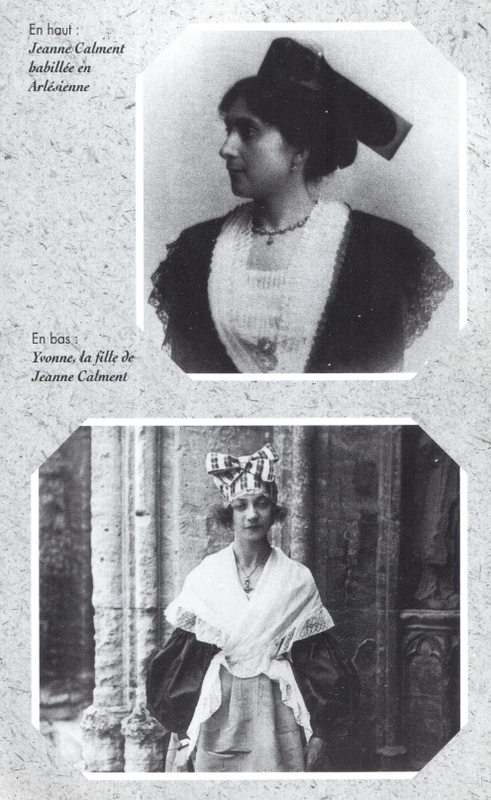 ^ "Photo Gallery of Madame Jeanne-Louise Calment [1875 - 1997]". Gerontology Research Group. Retrieved 17 December 2018. ^ Lenart, Adam; Aburto, José Manuel; Stockmarr, Anders; Vaupel, James W. (11 September 2018). "The human longevity record may hold for decades". Quantitative Biology > Populations and Evolution. arXiv. ^ a b Gavrilov, Leonid A.; Gavrilova, Natalya S. (2000). "Book Review: Validation of exceptional longevity, Odense University Press, 1999". Population and Development Review. 26 (2): 403–404. ISSN 0098-7921. ^ Baheux, Romain (31 December 2018). "Age de Jeanne Calment : l'Etat a-t-il "fermé les yeux" ?" [Jeanne Calment's age: did the State look the other way?]. Le Parisien (in French). Retrieved 1 January 2019. « Disons qu'on a vu passer le dossier et qu'on a fermé les yeux [»], poursuit notre source. ^ Deigin, Yuri (10 December 2018). "J'Accuse…! Why Jeanne Calment's 122-year old longevity record may be fake". Retrieved 12 December 2018 – via Medium. ^ "Cette surprenante théorie sur l'âge de Jeanne Calment affole les réseaux sociaux" [This surprising theory about Jeanne Calment's age sets social networks on fire]. HuffPost (in French). 30 December 2018. Retrieved 23 January 2019. ^ "La théorie qui déboulonne… Jeanne Calment" [The theory that debunks… Jeanne Calment]. Le Point (in French). 30 December 2018. Retrieved 23 January 2019. ^ Rubetti, Morgane (1 January 2019). "Des Russes remettent en cause l'âge de Jeanne Calment, doyenne de l'humanité" [Russians question the age of Jeanne Calment, world's oldest person]. Le Figaro (in French). AFP. Retrieved 23 January 2019. ^ Sage, Adam (1 January 2019). "Oldest ever woman Jeanne Calment, 122, may have been a fraud". The Times. London. Retrieved 1 January 2019. ^ a b Baheux, Romain (30 December 2018). "Jeanne Calment, une imposture ? Le Scientifique qui a validé son record s'insurge" [Jeanne Calment, a fraud? Scientist who validated her record protests]. Le Parisien (in French). Retrieved 31 December 2018. ^ Daley, Jason (2 January 2019). "Was the World's Oldest Person Ever Actually Her 99-Year-Old Daughter?". Smithsonian Magazine. Overnight, Fernand Calment would have passed his daughter off for his wife and everyone would have kept silent? It is staggering. ^ Baheux, Romain (24 January 2019). "Pourquoi la science se déchire sur l'affaire Jeanne Calment" [Why scientists are torn apart by the Jeanne Calment affair]. Le Parisien (in French). Retrieved 27 January 2019. ^ Comme si c'était hier: Jeanne Calment. Mise Au Point. Radio Télévision Suisse. 15 June 2014. Retrieved 2 December 2016. ^ "France 2 Interview with Dr Catherine Levraud, Medical Doctor Treating Jeanne Calment". France 2 television. 4 August 1997. Retrieved 6 December 2016. ^ Allard, Michel; Lèbre, Victor; Robine, Jean-Marie (1994). Les 120 ans de Jeanne Calment, doyenne de l'humanité [Jeanne Calment's 120 years, humanity's elder] (in French). Paris: Le Cherche-Midi. p. 92. ISBN 978-2-862743462. More than once, she surprised her entourage by her digestive abilities; she said herself 'I have the stomach of an ostrich!' which did not prevent her from appreciating good things. She showed herself more than once capable of absorbing considerable quantities of chocolate: more than a kilo per week. ^ Ritchie, Karen (February 1995). "Mental status examination of an exceptional case of longevity: J. C. aged 118 years" (PDF). British Journal of Psychiatry. INSERM. 166 (2): 229–235. doi:10.1192/bjp.166.2.229. PMID 7728367. Retrieved 9 January 2019. ^ 20h France 2 du 4 août 1997 - Mort de Jeanne Calment. France 2. Institut national de l'audiovisuel. 4 August 1997. Retrieved 9 January 2019. ^ The Guinness Book of Records, 1999 edition, p. 102, ISBN 0-85112-070-9. Robine, Jean-Marie; Allard, Michel (1999). Jeune, Bernard; Vaupel, James W. (eds.). Jeanne Calment: Validation of the Duration of Her Life. Validation of Exceptional Longevity. Odense University Press. ISBN 978-87-7838-466-9. Wikimedia Commons has media related to Jeanne Calment.